The tale behind this piece finding its way into the AFB Collection is another great story of how well our community can support each other, and the story behind the piece itself is a great example of creators interacting with collectors! Randy Bowen of Bowen Designs often gives fan sneak peeks of works in progress via his Facebook Page and the STATUEMARVELS Forum. These sneaks are often not just teasers, but used to seek feedback from prospective buyers about the design as it stands. It’s not totally uncommon for changes to be made based on the feedback that’s been given. 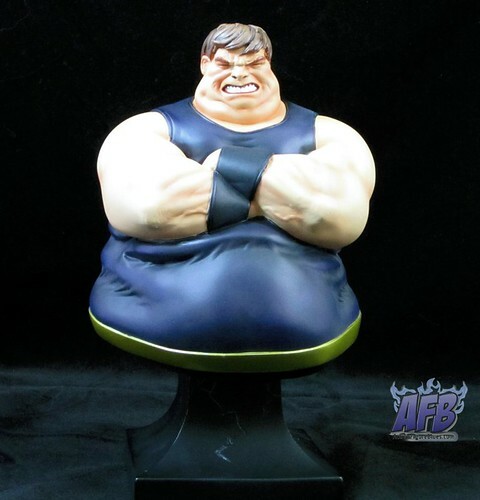 An example of this is the piece I’m looking at tonight: the Bowen Designs Web Exclusive Blob Mini-Bust. The original design for this was sneaked quite some time ago by Bowen, and met with a mixed reaction. Many fans felt that Blob’s head wasn't quite right, and the absence of his trademark yellow stripe from his costume was an oversight. Within a short amount of time, Randy had gone back to the drawing board, and the sculpt had the yellow stripe and a noggin which one could much more easily identify as Mr Fred J. Dukes himself! I haven't seen much out there to match Mr Bowen’s interaction with his fanbase! Where does the community bit come in? Well, that’s the next chapter of the Blob Mini-Bust story: it was announced as a Bowen Designs Website Exclusive. 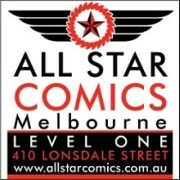 These exclusives create issues for this Down Under-based collector, because the BD website doesn’t ship internationally (something Bowen could definitely improve upon!). 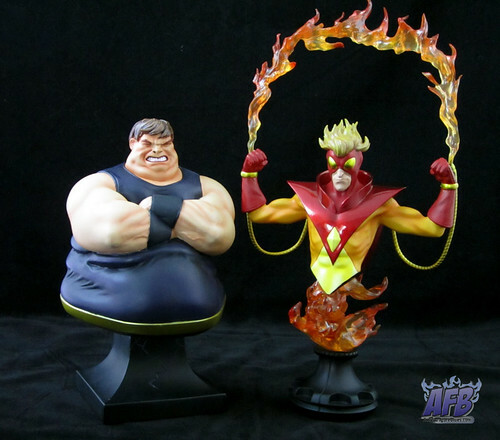 This wasn’t a lost cause, however, as the kind owners of STATUMARVELS, Al and Gene, not only run a great forum, they also run an online store which is dedicated to assisting international collectors to access the exclusive product! It’s a great way to help out fellow collectors, and the fact that they do it at cost makes it a truly amazing act! So, thanks to the STATUEMARVELS team, I was able to order my Blob Mini-Bust, and it arrived carefully packed a couple of weeks ago. It really is an amazing piece. To start with the aforementioned headsculpt, it definitely sums up the Blob quite nicely. I was a bit unsure of the closed eyes at first, but as I’ve gotten used to them, I think they help to communicate the mass on this man’s body in quite a clever way. The huge snarl, complete with beautifully detailed teeth, and the massive jowls and chins are masterfully sculpted. The skill of the sculptors is further demonstrated in the bulk of Blob’s form. I’m really impressed not just with the way that Blob’s weight is captured, but in the level of detail in things like the ripples in his clothing, and the crease in his mass created by his arms being folded over it. It’s easy to look at something like this and take for granted the detailed observation and study that must have gone in to making the three-dimensional detail work so expertly. The musculature, veins and flab in Blob’s arms are also true credits to the sculpting team. There have been some questionable paint jobs on some recent Bowen releases, but the paint on Blob is one of the piece’s greatest assets. There is a remarkable amount of shading used here, from the tones of his hair to the different flesh tones, which have been used to shade and highlight the flab on Blob’s arms and head. The only aspect of the piece I would pick up on is the colour of the base, which matches the black in Blob’s outfit almost exactly, thus losing the impact of the sculpt of the base, which is shown to be cracking under Blob’s weight. It’s a minor niggle, but it’s a shame to miss out on that nice extra detail. Blob is now sitting proudly alongside my Pyro Mini-Bust, which in this blogger’s humble opinion was the best bust of 2010. There is an Avalanche Mini-Bust on the way from Bowen, and then only Destiny is required for a Brotherhood of Evil Mutants Mini-Bust display. I await impatiently! Wow, Pyro does look great! If only Blob's eyes were open or his teeth clenched, it contibutes too much to looking like he's constipated. That face "is" the Blob.